, called the elder, to distinguish him from his nephew, was one of the most learned of the ancient Roman writers, and was born in the reign of Tiberius Caesar, about the year of Christ 23. His birth-place was Verona, as appears from his calling Catullus his countryman, who was unquestionably of that city. Tho ancient writer of his life, ascribed to Suetonius, and, after him, St. Jerom, have made him a native of Rome: father Hardouin has also taken some pains to confirm this notion, which however has not prevailed. 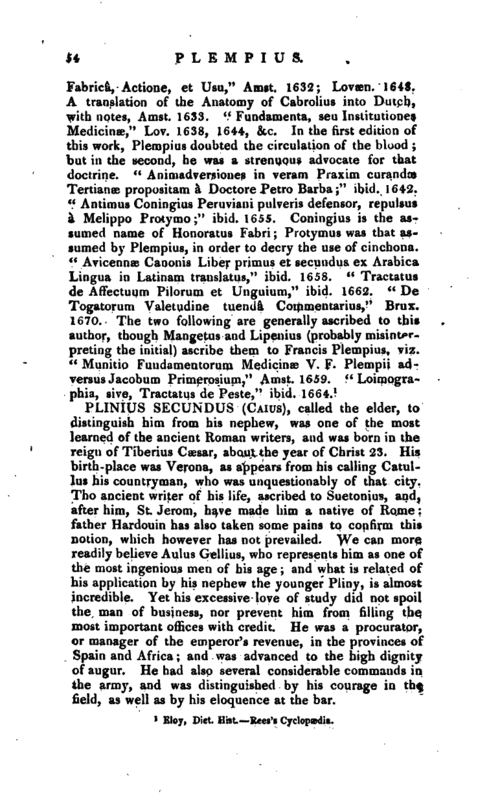 We can more readily believe Aulus Gellius, who represents him as one of the most ingenious men of his age; and what is related of his application by his nephew the younger Pliny, is almost incredible. Yet his excessive love of study did not spoil the man of business, nor prevent him from filling the most important offices with credit. He was a procurator, or manager of the emperor’s revenue, in the provinces of Spain and Africa; and was advanced to the high dignity of augur. He had also several considerable commands in the army, and was distinguished by his courage in the field, as well as by his eloquence at the bar. | His manner of life, as it is described by his nephew, exhibits a degree of industry and perseverance scarcely to be paralleled. In summer he always began his studies as soon as it was night: in winter, generally at one in the morning, but never later than two, and often at midnight. No man ever spent less time in bed; and sometimes he would, without retiring from his books, indulge in a short sleep, and then pursue his studies. Before day-break, it was his custom to wait upon Vespasian, who likewise chose that season to transact business: and when he had finished the affairs which the emperor committed to his charge, he returned home again to his studies. 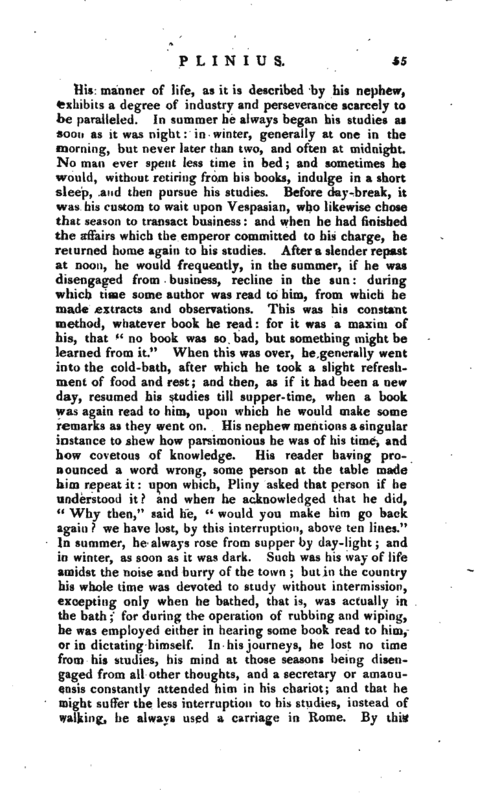 After a slender repast at noon, he would frequently, in the summer, if he was disengaged from business, recline in the sun: during which time some author was read to him, from which he made extracts and observations. This was his constant method, whatever book he read; for it was a maxim of his, that “no book was so bad, but something might be learned from it.” When this was over, he generally went into the cold-bath, after which he took a slight refreshment of food and rest and then, as if it had been a new day, resumed his studies till supper-time, when a book was again read to him, upon which he would make some remarks as they went on. His nephew mentions a singular instance to shew how parsimonious he was of his time, and how covetous of knowledge. His reader having pronounced a word wrong, some person at the table made him repeat it: upon which, Pliny asked that person if he understood it? and when he acknowledged that he did, “Why then,” said he, “would you make him go back again we have lost, by this interruption, above ten lines.” In summer, he always rose from supper by clay-light and in winter, as soon as it was dark. Such was his way of life amidst the noise and hurry of the town but in the country his whole time was devoted to study without intermission, excepting only when he bathed, that is, was actually in the bath for during the operation of rubbing and wiping, he was employed either in hearing some book read‘ to him, or in dictating himself. In his journeys, he lost no time from his studies, his mind at those seasons being disengaged from all other thoughts, and a secretary or amanuensis constantly attended him in his chariot; and that he might suffer the less interruption to his studies, instead of walking, he always used a carriage in Rome. By this | extraordinary application he found leisure to write a great many volumes. The circumstances of his death, like his manner of livr ing, were very singular, and are also described at large by the elegant pen of his nephew. He was at that time, with a fleet under his command, at Mis en urn, in the gulf of Naples; his sister and her son, the younger Pliny, being with him. On the 24th of August, in the year 79, about one in the afternoon, his sister desired him to observe a cloud of a very unusual size and shape. He was in his study; but immediately arose, and went out upon an eminence to view it more distinctly. It was not at that distance discernible from what mountain this cloud issued, but it was found afterwards to ascend from mount Vesuvius. Its figure resembled that of a pine-tree; for it shot up to a great height in the form of a trunk, which extended itself at the top into a sort of branches; and it appeared sometimes bright, and sometimes dark and spotted, as it was either more or less impregnated with earth and cinders. 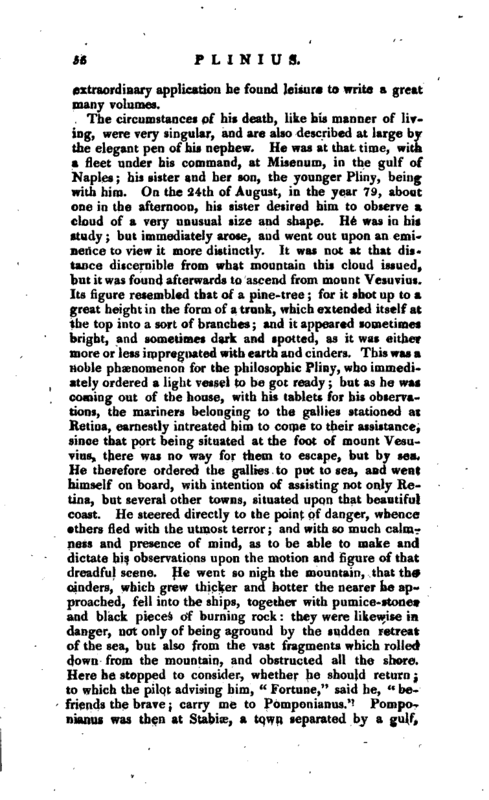 This was a noble phenomenon for the philosophic Pliny, who immediately ordered a light vessel to be got ready; but as he was coming out of the house, with his tablets for his observations, the mariners belonging to the gallies stationed at Retina, earnestly intreated him to come to their assistance, since that port being situated at the foot of mount Vesuvius, there was no way for them to escape, but by sea. He therefore ordered the gallies to put to sea, and went himself on board, with intention of assisting not only Retina, but several other towns, situated upon that beautiful coast. He steered directly to the point of danger, whence ethers fled with the utmost terror; and with so much calmness and presence of mind, as to be able to make and dictate his observations upon the motion and figure of that dreadful scene. He went so nigh the mountain, that tha cinders, which grew thicker and hotter the nearer he approached, fell into the ships, together with pumice-stonet and black pieces of burning rock: they were likewise in danger, not only of being aground by the sudden retreat of the sea, but also from the vast fragments which rolled down from the mountain, and obstructed all the shore. Here he stopped to consider, whether he should return; to which the pilot advising him, “Fortune,” said he, “befriends the brave; carry me to Pomponianus.” Pomponianus was then at Stabioe, a town separated by a gulf, | which the sea, after several windings, forms upon that shore. He found him in the greatest consternation, but exhorted him to keep up his spirits; and, the more to dissipate his fears, he ordered, with an air of unconcern, the baths to be got ready; when, after having bathed, he sat down to supper with apparent cheerfulness. Jn the mean while, the eruption from Vesuvius flamed out in several places with much violence, which the darkness of the night contributed to render still more visible and dreadful. 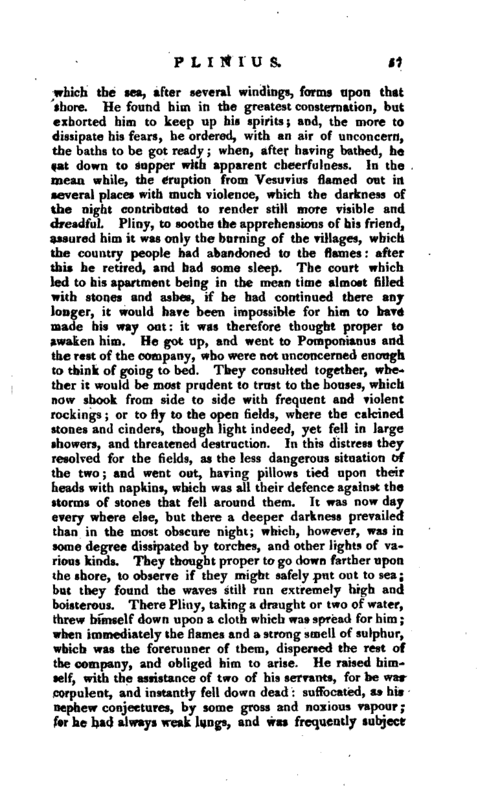 Pliny, to soothe the apprehensions of his friend, assured him it was only the burning of the villages, which the country people had abandoned to the flames: after this he retired, and had some sleep. The court which led to his apartment being in the mean time almost filled with stones and ashes, if be had continued there any longer, it would have been impossible for him to have made his way out: it was therefore thought proper to awaken him. He got up, and went to Pomponianus and the rest of the company, who were not unconcerned enough to think of going to bed. They consulted together, whether it would be most prudent to trust to the houses, which now shook from side to side with frequent and violent rockings; or to fly to the open fields, where the calcined stones and cinders, though light indeed, yet fell in large showers, and threatened destruction. In this distress they resolved for the fields, as the less dangerous situation of the two; and went out, having pillows tied upon their heads with napkins, which was all their defence against the storms of stones that fell around them. It was now day every where else, but there a deeper darkness prevailed than in the most obscure night; which, however, was in some degree dissipated by torches, and other lights of various kinds. They thought proper to go down farther upon the shore, to observe if they might safely put out to sea; but they found the waves still run extremely high and boisterous. There Pliny, taking a draught or two of water, threw himself down upon a cloth which was spread for him; when immediately the flames and a strong smell of sulphur, wkich was the forerunner of them, dispersed the rest of the company, and obliged him to arise. He raised himself, with the assistance of two of his servants, for he was corpulent, and instantly fell down dead: suffocated, as his nephew conjectures, by some gross and noxious vapour; for he had always weak lungs, and was frequently subject | to a difficulty of breathing. As soon as it was light again, which was not till the third day after, his body was found entire, and without any marks of violence upon it; exactly in the same posture that he fell, and looking more like a man asleep than dead. The sister and nephew, whom the uncle left at Misenum, continued there that night, but had their rest extremely broken and disturbed. There had been for many days before some shocks of an earthquake, which was the less surprising, as they were always extremely frequent in Campania: but they were so particularly violent that night, that they seemed to threaten a total destruction. 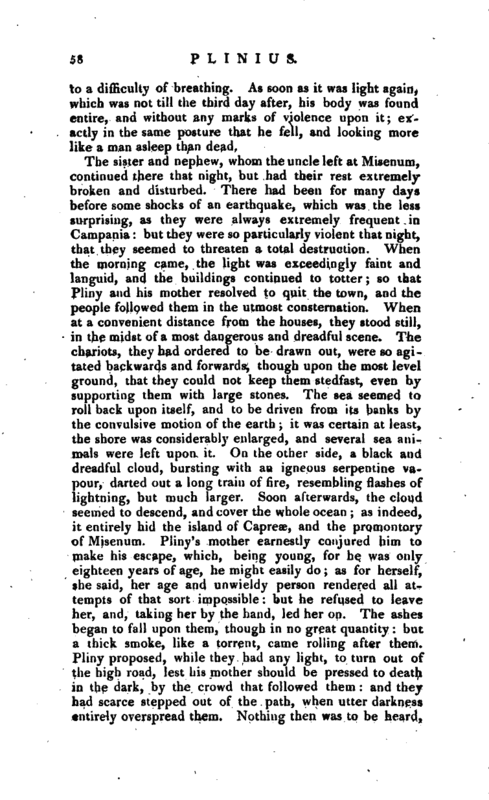 When the morning came, the light was exceedingly faint and languid, and the buildings continued to totter; so that Pliny and his mother resolved to quit the town, and the people followed them in the utmost consternation. When at a convenient distance from the houses, they stood still, in the midst of a most dangerous and dreadful scene. The chariots, they had ordered to be drawn out, were so agitated backwards and forwards; though upon the most level ground, that they could not keep them stedfast, even by supporting them with large stones. The sea seemed to roll back upon itself, and to be driven from its banks by the convulsive motion of the earth; it was certain at least, the shore was considerably enlarged, and several sea animals were left upon it. On the other side, a black and dreadful cloud, bursting with an igneous serpentine vapour, darted out a’ long train of fire, resembling flashes of lightning, but much larger. Soon afterwards, the cloud seemed to descend, and cover the whole ocean; as indeed, it entirely hid the island of Capreoe, and the promontory of Misenum. 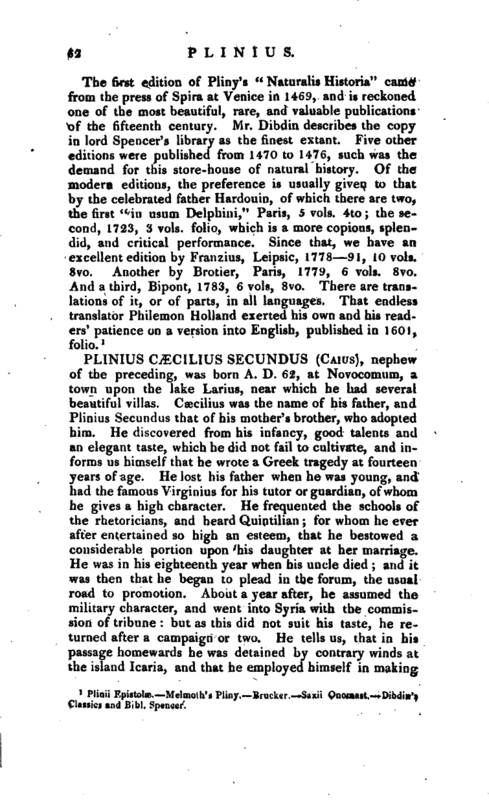 Pliny’s mother earnestly conjured him to make his escape, which; being young, for he was only eighteen years of age, he might easily do; as for herself, she said, her age and unwieldy person rendered all attempts of that sort impossible: but he refused to leave her, and, taking her by the hand, led her on. The ashes began to fall upon them, though in no great quantity: but a thick smoke, like a torrent, came rolling after them. Pliny proposed, while they had any light, to turn out of the high road, lest his mother should be pressed to death in the dark, by the crowd that followed them: and they had scarce stepped out of the path, when utter darkness entirely overspread them. Nothing then was to he heard. | says Pliny, but the shrieks of women, the screams of children, and the cries of men: some calling for their children, others for their parents, others for their husbands, and only distinguishing each other by their voices; one lamenting his own fate, another that of his family, some wishing to die from the very fear of dying, some lifting up their hands to the gods, but the greater part imagining that the last and eternal night was come, which was to destroy both the gods and the world together. At length a glimmering light appeared, not the return of day, but only the forerunner of an approaching burst of flames, which, however, fell at a distance from them; then again they were immersed in thick darkness, and a heavy shower of ashes rained upon them, which they were obliged every now and then to shake off, to prevent being buried in the heap. At length this dreadful darkness was dissipated by degrees, like a cloud or smoke: the real day returned, and even the sun appeared, though very faintly, and as when an eclipse is coming on; and every object seemed changed, being covered over with white ashes, as with a deep snow. Pliny owns very frankly, that his support, during this terrible phenomenon, was chiefly founded in that miserable, though strong consolation, that all mankind were involved in the same calamity, and that the world itself was perishing. 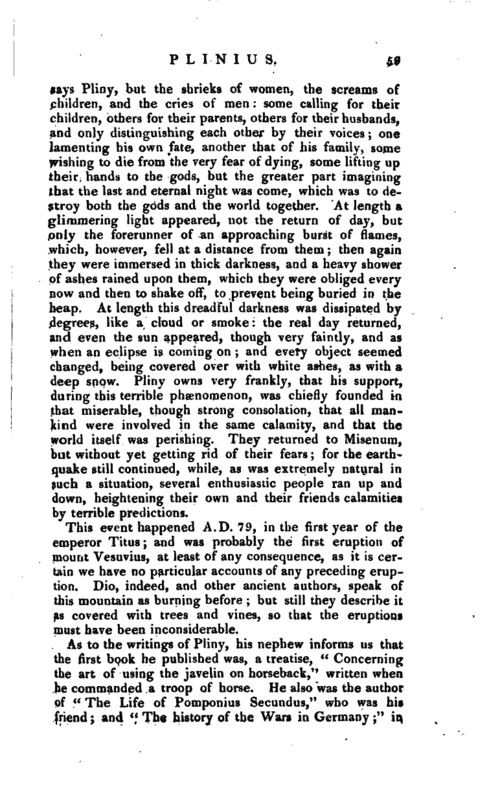 They returned to Misenum, but without yet getting rid of their fears; for the earthquake still continued, while, as was extremely natural in such a situation, several enthusiastic people ran up and down, heightening their own and their friends calamities by terrible predictions. This event happened A.D. 79, in the first year of the emperor Titus; and was probably the first eruption of mount Vesuvius, at least of any consequence, as it is certain we have no particular accounts of any preceding eruption. Dio, indeed, and other ancient authors, speak of this mountain as burning before; but still they describe it as covered with trees and vines, so that the eruptions must have been inconsiderable. As to the writings of Pliny, his nephew informs us that the first book he published was, a treatise, “Concerning the art of using the javelin on horseback,” written when he commanded a troop of horse. He also was the author of “The Life of Pomponius Secundus,” who was his friend; and “The history of the Wars in Germany;” ia | which he gave an account of all the battles the Romans had had with the Germans. His nephew says, that a dream, which occurred when he served in the army in Germany, first suggested to him the design of this work: it was, that Drusus Nero, who extended his conquests very far into that country, and there lost his life, appeared to him, and conjured him not to suffer his memory to be buried in oblivion. 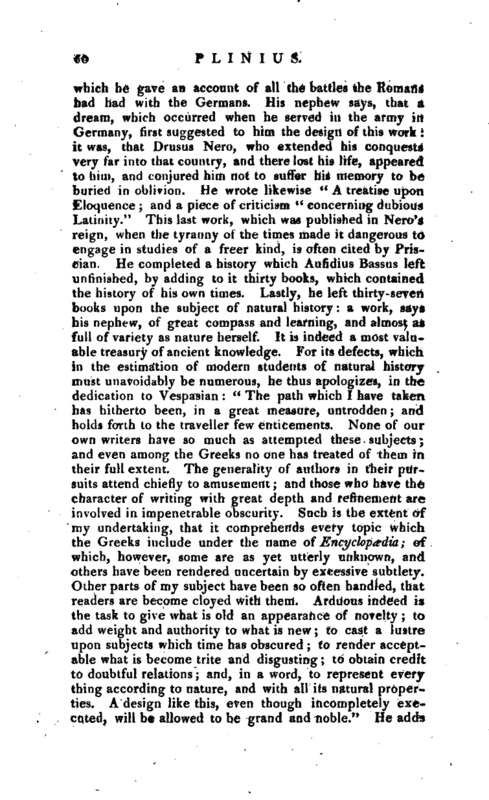 He wrote likewise “A treatise upon Eloquence; and a piece of criticism” concerning dubious Latinity.“This last work, which was published in Nero’s reign, when the tyranny of the times made it dangerous to engage in studies of a freer kind, is often cited by Prisrcian, He completed a history which Aufidius Bassus left unfinished, by adding to it thirty books, which contained the history of his own times. Lastly, he left thirty-seven books upon the subject of natural history: a work, sayi his nephew, of great compass and learning, and almost as full of variety as nature herself. It is indeed a most valuable treasury of ancient knowledge. For its defects, which in the estimation of modern students of natural history must unavoidably be numerous, he thus apologizes, in the dedication to Vespasian:” The path which I have taken has hitherto been, in a great measure, untrodden; and holds forth to the traveller few enticements. None of our own writers have so much as attempted these subjects; and even among the Greeks no one has treated of them in their full extent. The generality of authors in their pursuits attend chiefly to amusement; and those who have the character of writing with great depth and refinement are involved in impenetrable obscurity. Such is the extent of my undertaking, that it comprehends every topic which the Greeks include under the name of Encyclopedia; of which, however, some are as yet utterly unknown, and others have been rendered uncertain by excessive subtlety. Other parts of my subject have been so often handled, that readers are become cloyed with them. Arduous indeed is the task to give what is old an appearance of novelty; to add weight and authority to what is new; to cast a lustre upon subjects which time has obscured; to render acceptable what is become trite and disgusting; to obtain credit to doubtful relations; and, in a word, to represent every thing according to nature, and with all its natural properties. A design like this, even though incompletely executed, will be allowed to be grand and noble.“He adds | afterwards,” Many defects and errors have, I doubt not, escaped me; for, besides that I partake of the common infirmities of human nature, I have written this work in the midst of engagements, at broken periods which I have stolen from sleep." 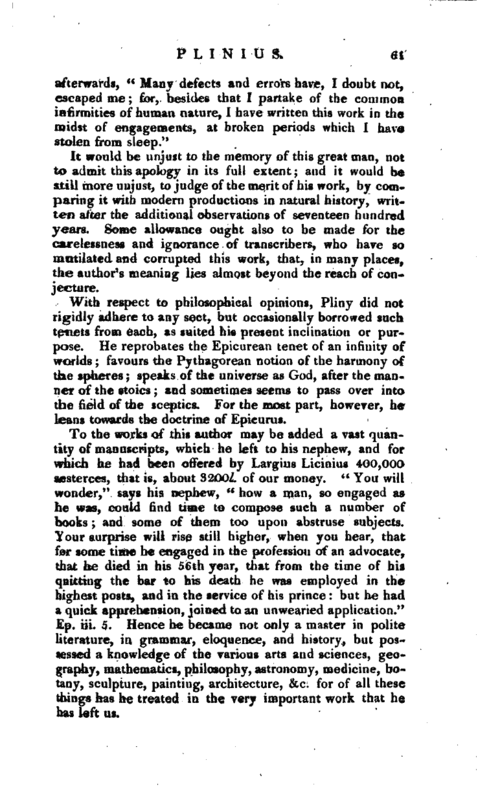 It would be unjust to the memory of this great man, not to admit this apology in its full extent; and it would be still more unjust, to judge of the merit of his work, by comparing it with modern productions in natural history, written after the additional observations of seventeen hundred years. Some allowance ought also to be made for the carelessness and ignorance of transcribers, who have so mutilated and corrupted this work, that, in many places, the author’s meaning lies almost beyond the reach of conjecture. With respect to philosophical opinions, Pliny did not rigidly adhere to any sect, but occasionally borrowed such tenets from each, as suited his present inclination or purpose. He reprobates the Epicurean tenet of an infinity of worlds; favours the Pythagorean notion of the harmony of the spheres; speaks of the universe as God, after the manner of the stoics; and sometimes seems to pass over into the field of the sceptics. For the most part, however, he leans towards the doctrine of Epicurus. Plinii Epistolæ.—Melmoth’s Pliny.—Brucker.—Saxii Onomast.—Dibdin’s Classics and Bibl. Spencer.